Attempting to recreate physical property damage in a laboratory setting requires you to determine a complex combination of interrelated properties. The objective is for the test to provide predictive performance under a specified set of criteria and correlate with end-use performance. However, developing the test methodology is both complex and difficult. Prior to conducting any laboratory test, your first step should be to establish the purpose of the test. By formally stating your objective(s), you define why you are undergoing tests. Laboratory tests have the potential to provide considerable insight into various factors that contribute to the materials performance, and it is easy to become distracted. To generate useful data during abrasion tests, careful consideration must be given to the wear system and wear mode. The wear system is comprised of the materials that experience the relative movement. The wear mode or modes is established by how the system wears. Identifying the dominant wear mechanism at the beginning of the test will help to ensure the results are meaningful. A similar approach is used when conducting scratch tests. How do you determine the conditions a product may be exposed to? The first approach is to consider prior knowledge. If you are studying a field failure, examine the appearance of the surface wear from an actual part. Or, you can try to match the operating conditions. Keep in mind there may be multiple wear modes occurring at the same time and recognize that matching conditions in a laboratory are usually NOT perfect. Intrinsic parameters relating to the materials involved, such as their nature, surface condition and finish. These include bulk properties (chemical composition, physical characteristics, mechanical properties, hardness) and surface properties (roughness, physico-chemical characteristics). External parameters relating to the sliding conditions, such as applied load, sliding velocity, characteristics of the motion, mode of contact, ambient conditions (temperature, humidity), and interstitial substances (lubricant, wear debris). Parameters depending on both the nature of the materials involved and the sliding conditions, particularly surface temperature of the rubbing surfaces. The next step is to develop a testing methodology and select a tester. 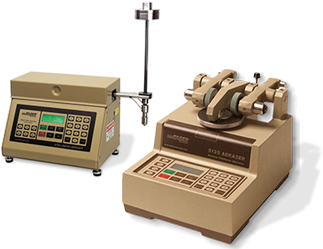 Many industries have established test procedures and recommend instruments that might be used. This information can usually be obtained by contacting a testing laboratory, industry association, or organization such as ASTM International. If a method does not exist or you decide not to follow the industry standard, you need to select a test that models the system you wish to study. There are many widely used instruments available that should satisfy this goal, and it may be necessary to perform initial trials and match the wear mechanism. A basic principal of establishing new abrasion tests is to use the simplest technique first and to stop once the required information is available. Quite often, the additional information that is obtained by studying additional factors does not justify the additional time and cost. The general methodology for conducting abrasion tests should include some common reporting items in order to generate meaningful results. It should also be mentioned that developing a correlation between laboratory test results and field data is difficult and time consuming and may not be necessary in all cases. While it is advisable to establish a predictive wear model for design and component life estimation, no model is universally satisfactory owing to the many potential factors that could affect wear.